The midstream sector is out of favor today, with the Alerian MLP ETF still off roughly 45% from its mid-2014 highs. But you have to be careful what you buy in this sector: Many midstream master limited partnerships have been forced to cut distributions in recent years because of industry headwinds. That, however, hasn't happened to Enterprise Products Partners L.P. (NYSE:EPD), one of the largest midstream companies in North America. And it's taking steps to ensure it never does, creating a buying opportunity for income investors across the risk spectrum. Midstream companies own the assets that move oil, natural gas, and related products around the country. The energy industry simply can't operate without these pipelines, storage facilities, processing plants, and transportation hubs. So long as we continue to use these fuels and products, Enterprise and its peers have customers that can't function without their services. Moreover, these are often one-of-a-kind assets that can't be easily replaced -- there are only so many locations that can support a seaport, for example -- giving large players like Enterprise monopoly like positions in some markets. Investors were pretty excited about this space a few years back, pushing the prices of midstream companies higher and their yields lower. That all changed in mid-2014 when the oil price bubble burst. Midstream stocks fell hard right along with oil prices, with the Alerian MLP ETF down by more than 50% at one point. Midstream partnerships that made heavy use of leverage and were forced to cut distributions seemed to validate the sell-off. Enterprise fell, too, and remains roughly 30% off of its peak prices. Only it never over-leveraged itself, with its debt to EBITDA toward the low end of the industry. Distributable cash flow, meanwhile, has covered its distribution by a robust 1.2 times or more in each of the last five years -- right through the oil bear market. And Enterprise continued to reward investors with distribution increases throughout the downturn. This midstream company hasn't skipped a beat or let unitholders down. 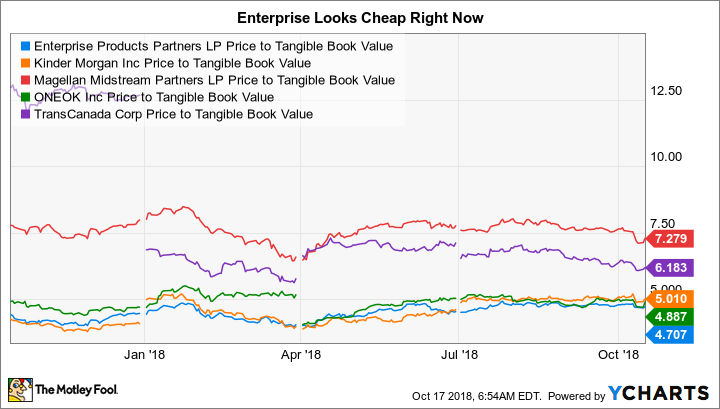 At this point, Enterprise's price to tangible book value is about 4.7 times, which is around the same level as many of its closest peers. The problem with that is that Enterprise is one of the best run midstream partnerships. It should probably trade at a valuation multiple closer to that of Magellan Midstream Partners, L.P. (NYSE:MMP), another well run midstream player which has a price to tangible book value of nearly 7.3 times. While this price disparity exists, investors of all stripes have an opportunity to pick up Enterprise's hefty 6% yield. 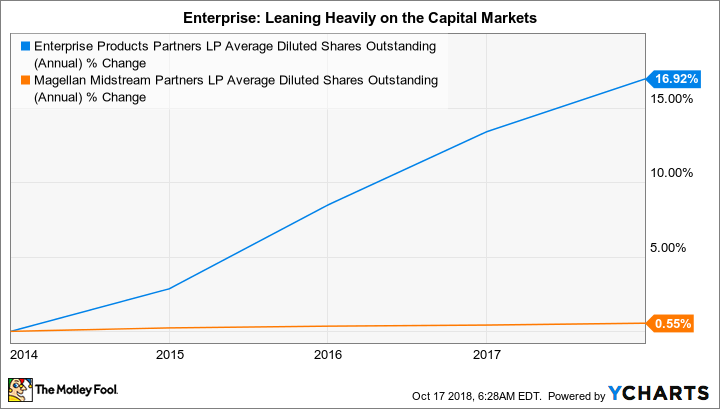 The big question here, however, is what would shift investors' opinions of Enterprise so that the valuation gap between these two partnership's closes. The answer is part of the valuation problem right now: Enterprise has made a business decision to slow down distribution growth for a little while so that it can fund more of its growth investment plans with internally generated cash. That's one of the big differences between Magellan and Enterprise: Enterprise has historically made greater use of dilutive unit sales to fund growth, while Magellan has long focused on self funding its expansion. The general idea is that Enterprise needs to find a new equilibrium between the cash it retains and the cash it distributes. Once it has found a new balance, investors should expect distribution growth to pick back up again. Historically Enterprise has increased its distribution in the mid single digits annually. While this business revamp is taking shape, hikes will likely be in the low single digits. That's a bit disappointing but will improve the partnership's business over the long term. To be fair, Magellan has historically increased its distribution at a higher rate (around 10% on an annualized basis over the past decade) than Enterprise, which is another reason for the price difference between the two partnerships. However, Magellan is only projecting distribution growth of 5% to 8% over the next couple of years. The low end of that range is what investors should expect from Enterprise once this transition phase is complete. Which is why, as Enterprise shifts toward a model that more closely resembles Magellan's approach, the discount between the two should narrow, even if it doesn't completely close. Enterprise is simply a better-than-average midstream partnership. The problem right now is that Enterprise can't just flip a switch -- it needs to let its current round of investment spending play out, a process that takes time. Once the assets it's building start to add materially to its cash flows it will be able to start self-funding more growth. The partnership is already making visible progress, with distribution coverage through the first half of the year at 1.5 times on a 27% increase in distributable cash flow. Enterprise gets closer and closer to its goal as its cash cushion grows. When it finally announces that it has transitioned its business model, distribution growth will likely tick higher again and the stock market should reasonably reward it with a higher valuation. Which suggests that, despite the slowdown in distribution growth, now is the time to add Enterprise Products Partners to your portfolio. Eventually, the market will catch on to the progress being made here.